But the Democrat-media complex is so quick to give Barack Obama the credit for this and not President Donald Trump. The Obama water carrying ABC News wrote, “But Exxon’s expansion plan was hatched long before Trump entered the White House: investments began in 2013, during Barack Obama’s presidency, and are expected to continue through at least 2022, according to Exxon.” REALLY? As if fossil fuel related jobs would have ever been created in an Obama administration or Hillary Clinton. GET REAL. Who honestly has the audacity but the liberal MSM to think that fossil fuel jobs and investment would have taken place under a presidency that loathed oil. Presidents do not generally create jobs, unless you are Donald Trump and actually get personally involved in negotiations with companies and keep jobs in America as opposed to going elsewhere, what presidents do is to create an environment conducive to business. That is what Trump has done. There is no way under the liberal war on coal and energy that Exxon-Mobile would have ever pulled the trigger on this. But Exxon’s expansion plan was hatched long before Trump entered the White House: investments began in 2013, during Barack Obama’s presidency, and are expected to continue through at least 2022, according to Exxon. Still, during a keynote speech Monday at an oil and gas industry conference in Houston, Woods gave credit to the Trump administration. 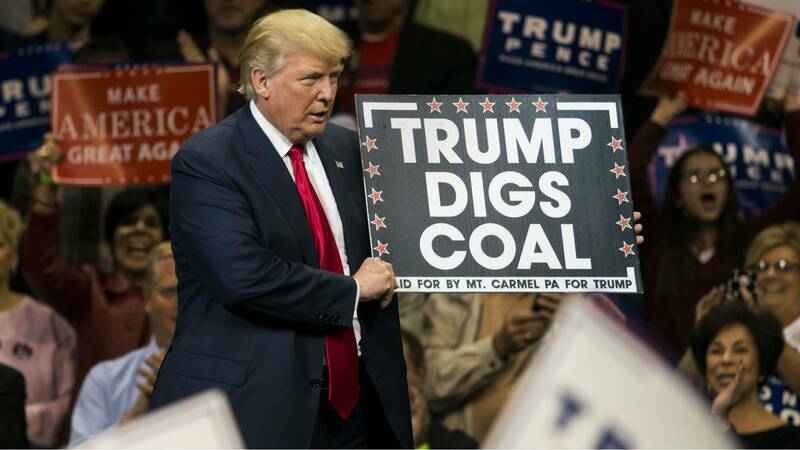 After years of unreasonable delays during the Obama administrative, on Tuesday, day two of the Donald Trump presidency, he signed signed executive actions to advance the approval of the stalled pipelines. Trump said he considered himself and environmentalist; however, the stated the process was far too slow and he wanted to speed up the process. Trump stated that these projects will create 28,000 great construction jobs. Trump also signed an executive order directing if pipelines are built in the United States, the pipes will be built in the United States. Trump has hit the ground running and the business out of the White House has been astounding. It’s only been two days and Trump has been like the EverReady bunny. With one swipe of the presidential pen, the Dakota Access and Keystone XL pipelines were back on the agenda, marking the realization of protesters’ worst fears about what Donald Trump presidency means for the environment and the controversial energy projects. Trump on Tuesday signed executive actions to advance the approval of the stalled pipelines. The proposed $3.7 billion Dakota Access pipeline was slated to stretch 1,172 miles through four states — from North Dakota into South Dakota, winding through Iowa and ending in southern Illinois — and move 470,000 barrels of crude oil a day across the Midwest. It is completed except for a contested portion under Lake Oahe in North Dakota, which is half a mile upstream from the Standing Rock Sioux tribe’s reservation. The $8 billion Keystone XL pipeline was proposed to stretch nearly 1,200 miles across six states — Montana, South Dakota, Nebraska, Kansas, Oklahoma and Texas — and carry more than 800,000 barrels of carbon-heavy petroleum daily from Canada’s oil sands through Nebraska to refineries on the Gulf Coast. The Divider in Chief, the Community agitator in chief has done it again. Outgoing, lame duck president Barack Obama has banned oil and gas drilling with his pen from hundreds of millions of acres of federally owned land in the Arctic and Atlantic Ocean. What a shock that he would do this on the way out the door and impacting a Trump presidency, as opposed to doing it prior to the 2016 elections. However, the gutless wonder in chief would never had provided such a pre-election gift to the environmental wackos as it would have affected the election in a negative manner for Democrats. Even though White House mouthpieces say this executive order cannot be undone by a future president, look for Trump to squash this like a bug. One thing is for certain when it comes to Trump, he hardly cares about precedent when it comes to this type of stuff and neither do those who elected him president. Look for the community agitator to further reek havoc as he heads out the door. According to White House officials, their actions to make the areas off limits to future oil and gas exploration and drilling as indefinite. They further went on to say that the withdrawals under Section 12-A of the 1953 act used by presidents dating to Dwight Eisenhower cannot be undone by an incoming president. Sorry, I find that almost impossible to believe. I second Instapundit’s opinion in that it is hard to believe that one president’s signature is more important than another’s. To make such a comment that another president, namely Donald Trump, will not be able to undo Obama’s executive order sounds almost vindictive.